The summer months have finally arrived and in the beauty world, there is always a massive focus on glowing skin. Although many of us will have holidays booked and getting the summer glow, that doesn't mean that we all can't be getting our glow on back home! For me, having a nice glow to my skin is not about how much sun I have seen (although I am very fortunate to tan very easily), it is about seeing my skin glow wherever I am. Today's post is about all the products that can help us all get the glow on without the need to get your passport out! As I have said before, I am not the biggest wearer of foundation and I only really wear it on special occasions and one of my favourites I have tried so far is the Rimmel Wake Me Up Foundation. The Wake Me Up foundation contains radiance pearls and whilst it can took a little glittery in the bottle, you do get a really nice glow to your skin. Unfortunately there still isn't a wide range of shades for this foundation (and in fact, almost every drugstore foundation out there!). I also like that this is a very light coverage foundation. Liquid illuminators are a great way to subtly add highlight and glow to your skin or act as a great base for even more highlighter! I used to use Benefit High Beam and it is one of their cult products, I prefer to use it just as a base because it is a little too pink-toned against my skin-tone but I have seen it look amazing on other people. My current favourite liquid illuminator is the L'Oreal Paris True Match Highlight Liquid Glow Illuminator in Golden Glow. It works great under foundation, blended out on its own, as a base for highlighters and it is also very easy to mix with other products. In the last few days I have been mixing it with some concealer to add a very subtle glow and it worked really well! They also do this in a pink-toned shade as well! If you find highlighting a little tricky or you just want even more glow from your cheeks, a nice glowy blush is the way to go! I really like using the Benefit Sugarbomb blush as it gives some glow without looking too shimmery. I feel like Benefit's blushes have been forgotten about as there is a big focus on attractive packaging and the Benefit packaging doesn't always fit the current hype. However I think their blushes are really great and should get more attention! Now onto the main event! 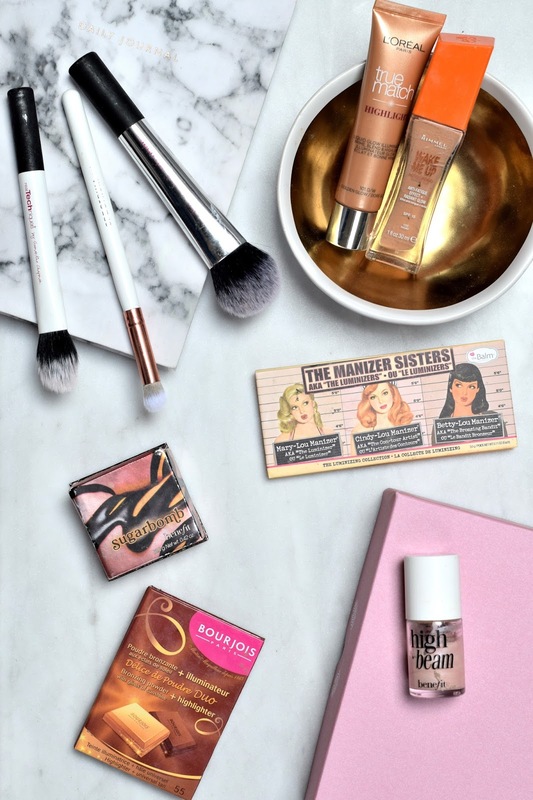 There are so many highlighters out there now and so many of them are great! My favourite highlighters are the Mary-Lou Manizer from my The Manizer Sisters palette and the Bourjois Delice De Poudre Duo. I have never used a highlighter than gives more glow and not just shimmer than the Mary-Lou Manizer! You only a small amount to make a difference and it also has a very good lasting power. The Bourjois highlighter is a lot more subtle and I have used it a couple of times as a eyeshadow and it worked really nicely. I really hope that you enjoyed reading this post and although there have been so many tragic events that have occurred both in the UK and across the world that you are not afraid to be yourself and try to enjoy our summer this year in defiance of anyone who tries to take our happiness and divide us.